What better way to say "I love you!" on Valentine's Day than to bake something spectacular for that special someone in your life? Like a delicious and moist, heart-shaped cake! You may be thinking, "Unfortunately, I don't have a heart-shaped pan, so I'm not able." But don't you fret! We have a fun and creative way to get that wonderful, signature shape, by using just two pans: a square one and a round one. We've compiled a list below of super delectable cake recipes that work wonderfully with this technique. Just make a selection and get ready to bake! Since it will take two different shapes -both square and round- to make the heart shape, start with making enough batter for a two-layer cake. You will need to divide the batter between one 8-inch round pan and one 8-inch square pan. Once the cakes have baked, per the instructions on the recipe, and cooled, remove both from their respective pans. Using the back of a large sheet pan or cutting board, wrap your base in aluminum foil (so the dye from the Red Velvet—if you're using that recipe—doesn't stain the base), and place the square cake on it so it looks like a diamond. It's a good idea to verify the fit of the cake before proceeding, as you don't want your cake to fall off the edges. At this point, use a serrated knife to cut the round cake in half. Attach each of the halves to either side of the top of the square. As you can see, they aren't exactly even when you line up the round halves. This is fine! Using a cake knife (finely-serrated, long-bladed knife), slice away some of the bottom of the cake from each half of the round cake, until the round portions and the square portion are equal in height. Once all three pieces are even, it's time to ice the cake! First, create a crumb coat. This is the first layer of icing that goes onto a cake. Also known as "dirty icing," this base layer seals the crumbs into this layer of icing, so that the second layer is clean and more aesthetically pleasing to the eye. To create the crumb coat, spoon or pipe your icing onto the center of the cake. Using an offset spatula, gently spread out the icing all over the top. Baker's Tip: Keep an empty bowl next to you so that you can wipe off the spatula if it becomes too inundated with crumbs. That way your original bowl of icing is kept clean. Next, using that same method, create the crumb coat for the sides. Once you have created this first layer all over the cake, put the cake in the refrigerator for 20 minutes, to allow the crumb coat to firm up a bit. This will allow creating the second layer to be much easier. After 20 minutes in the fridge, take your cake out and complete the second layer, using the same method as above. If you want to brighten up the color of the icing, try adding some fun dyes to the mix! Remember, you're only limited by your imagination. So, shoot for the stars and go big! Once you've completed icing your cake, it's time for the finishing touches! 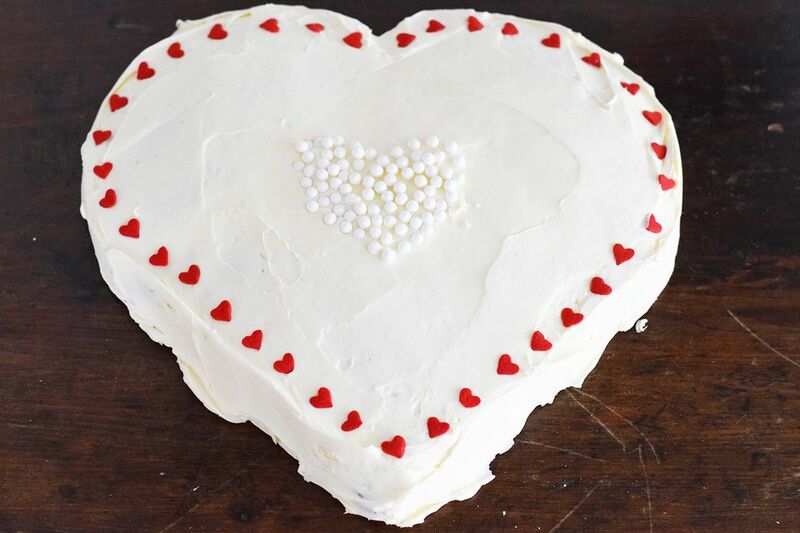 We created a perimeter of heart-shaped sprinkles and then created a cute little mini heart of white nonpareils in the center of the cake.